Tecmo's PlayStation 3 third-person shooter Quantum Theory isn't just for the PS3 anymore, now coming to North American Xbox 360 consoles as well this spring. No, that screenshot isn't a PlayStation 3 owner's head exploding at the loss of an exclusive title to the Xbox 360. 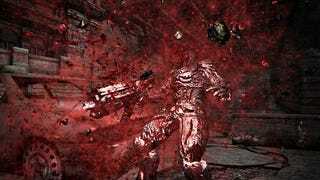 Judging by the reaction to McWhertor's hands-on with the game during this year's Tokyo Game Show, this Gears of War-looking action shooter isn't exactly a large glowing dot on anyone's radar, so news that it's coming out on the Xbox 360 as well should be met with a mild 'hmm.' It does have that interesting art nouveau environment and the ever-shifting Living Tower going for it, but then it's a third-person shooter created by a Japanese developer, which seems to raise warning flags in many a gamer's mind. So yes, Quantum Theory is coming to the Xbox 360 and PlayStation 3 this spring. How excited are you?